Join YPT for what we believe to be the cheapest ever travel package to take people into the DPRK as we visit all the must see sites of Pyongyang. 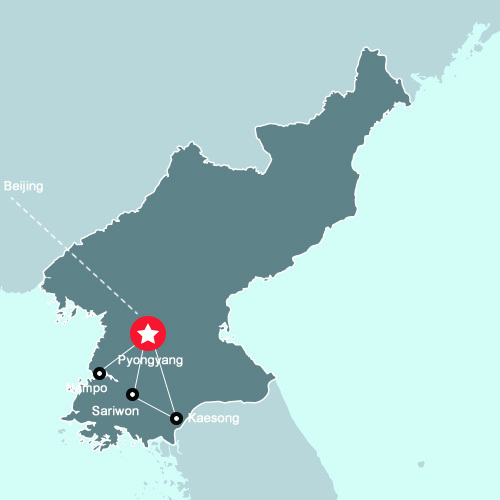 By making use of travelling from Dandong (which is easily reachable from most of China), and the more than comfortable Youth Hotel in Pyongyang, we are able to offer a great price that has you in the country for 2 nights, 3 days, which is inclusive of one full day seeing all the main sites of Pyongyang, going out both nights of the trip, as well as most importantly seeing all the celebrations that will be taking place around Pyongyang. Please note: Unfortunately we are unable to take travellers using US passports on our Ultra Budget tours due to DPRK restrictions. US travellers are required to fly in and out of the DPRK. For all other travellers you must have a re-entry visa into China as there isn’t enough time to apply for a Chinese visa in Pyongyang and the 72 hour transfer visa doesn’t permit rail use. Meet your YPT guide at 8:00am inside the entrance of the Dandong Railway Station to collect your train ticket and DPRK visa, and to go through DPRK procedure. Board the 9:25am train from Dandong. 10:25am arrival in Sinuiju to go through the thorough DPRK entry procedure. Visit Mansudae Grand Monument to show our respects to the President Kim Il Sung and the Leader Kim Jong Il. (Optional extra- you can present flowers if you wish: small bunches are 2 euro, larger ones 4). We expect it to be very busy at this time with locals paying their respect. Juche Tower- The tallest stone tower in the world, it represents the eternally burning Korean Juche Ideology. Optional extra: ride the lift to the top for amazing panoramic views of Pyongyang city. Dinner at the National Restaurant with performance! Kaeson Funfair – enjoy the latest of the DPRK’s amusement parks! (Entry 2 euros, rides 3 to 5 euros extra each depending on how awesome they are). Taedonggan Diplomat’s club. There’s local and imported drinks, karaoke, billiards, ping pong, and a great chance to meet some local Pyongyang expats! Slow drive to the train station stopping at a few interesting places for some final photos! 1. Twin share accommodation (single supplements available for an extra 40 EUR per night). 2. Train in and out Dandong-Pyongyang-Dandong. Flights are extra. 3. All meals in the DPRK unless otherwise stated. 6. All entrances (unless otherwise stated). 4. Tips for Korean guides and the driver.